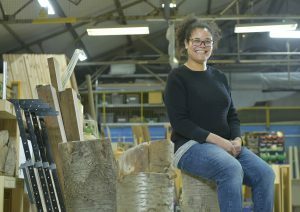 A £20,000 special loan for business start-ups that want an alternative to traditional finance has enabled sparks to fly once again behind the doors of a former 19th Century coachworks in Leith, transforming the space into an open access workshop for artists and makers. 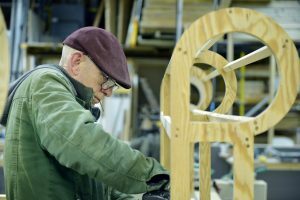 Wood workers, metal workers, props makers, designers and creative companies of every ilk are now making their home at Edinburgh Open Workshop where investment has helped turn the 10,000 sq ft space at Assembly Street into a place of collaboration and creativity. The open access workshop offers membership-based, pay-as-you-goworkshop facilities with access to machinery, power tools, hand tools, workbenches, fabrication bays for hands-on work, craft bays for cleaner work, longer-term resident maker space, studios and office space. 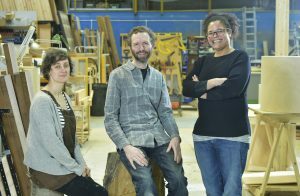 Edinburgh Open Workshop is the brainchild of Stuart Nairn, Natasha Lee-Walsh and Nicola Milazzo who hit upon the idea for a new type of co-working facility for creative talent in the city when they struggled to find a suitable base for sister company Big House Events. Natasha said: “We needed a new home for the work Big House does, designing and building sets for events, exhibitions and theatre. We became aware of other creative businesses struggling for quality space too. While there is other co-working space in the city for desk work there isn’t anything to accommodate you if you’re noisy and messy! 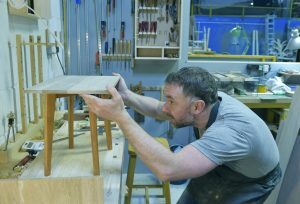 29 makers already share the space at the workshop including furnituremakers, a boatbuilder, metal workers, blade smiths, textile designers, sound designers, theatre producers, theatre designers, crafters, textile workers and prop makers. Transmit Start-Ups is the UK’s leading provider of Government-backed Start Up Loans and has backed the business dreams of 1,091 entrepreneurs in Scotland with over £11 million in finance. Transmit’s loans offer entrepreneurs an alternative to traditional finance, with low interest repayments and high-impact mentoring. Edinburgh Open Workshop will now work with Transmit Start-Ups’ Business Adviser Morag Kelly to maximise the impact of their investment. Morag said: “This is an especially exciting Start Up Loan because it will ultimately help support the launch of an entire community of new creative businesses in Edinburgh. Transmit Start-Ups is part of the Transmit Group of companies which offer funding, consulting, coaching and mentoring services to entrepreneurs throughout their business journey.